Bills season ticket members will be Rocking the Ralph again next season! 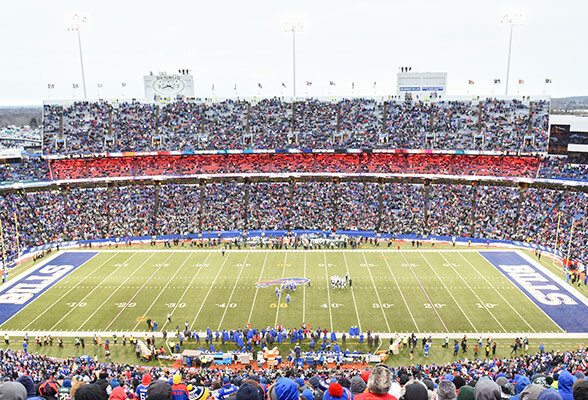 Over 52,000 Bills fans have already renewed for 2016! This marks the earliest date in team history the Bills have surpassed the 50k mark and the second straight season they have eclipsed this milestone. The Bills currently have a wait list for fans looks to purchase outdoor non-club seats. Fans interested in getting more information on becoming a season ticket holder can call 1-877-BB-TICKS or go to buffalobills.com. The Bills announced Tuesday the date that individual game tickets go on sale. Individual game tickets will go on sale to the general public Wednesday, July 10th at 9 am. Individual game tickets for the regular season opener against the New England Patriots (September 8) are sold out. As part of the Bills Season Ticket Holder benefits program, Season Ticket Holders had the opportunity to purchase group and individual game tickets in advance. Group tickets (15 or more) had also previously been made available to the general public. Special group pricing is available for the Cincinnati, Kansas City, New York Jets and Miami games. Season tickets for 2013 remain on sale, which provide significant savings off of individual game prices as well as exclusive benefits. The 13th annual Kids Day Game will be held at Ralph Wilson Stadium Friday, August 16, 2013. Fans can purchase tickets online through buffalobills.com/tickets, by phone at 1-877-BB-TICKS (1-877-228-4257), or by visiting the Ralph Wilson Stadium Box Office.